This shorter square steel posts come in 1 in to 3 in widths. They have a golf ball finial on top. 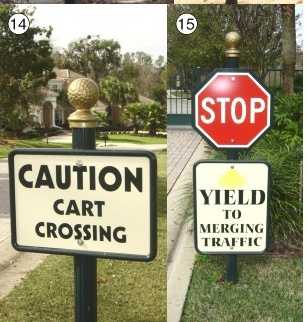 Any single-spaced sign is easily attached with two bolts; a double-faced sign is mounted on top with a special fixture.Shown on the left is a round post and rectangular steel frames; on the right is a square post and a sign with a decorative scroll bar.These dimensional traffic signs are carved from HDU with a coating for longevity and protection against damage.